11th Random Pick from My Collection. Invented by Tony Durham in 1982 and distributed by Uwe Meffert, the Skewb is a twisty puzzle with 4 axis of rotation. The corners are stationary, which means that only the four diagonals of each face rotate, turning half the cube with every single move. Solving wise, it's similar to the Pyraminx, although it's a bit more difficult to orientate the corners. 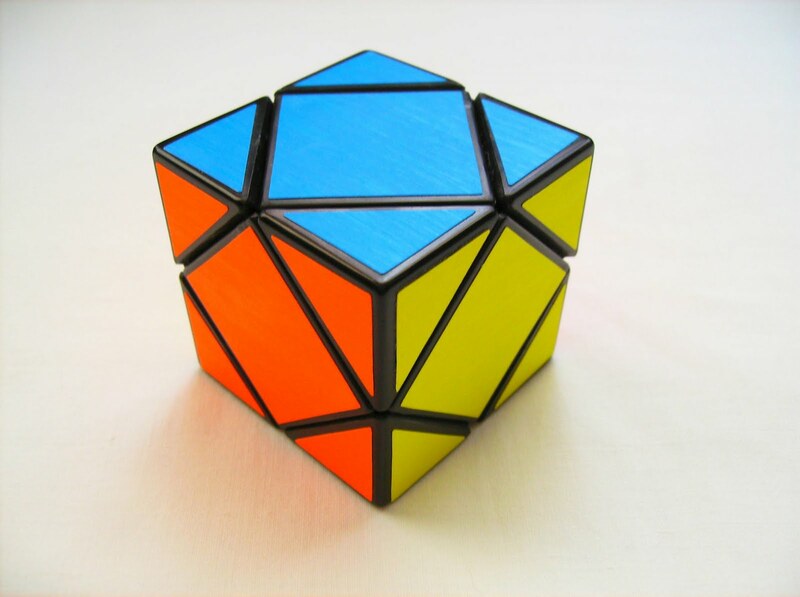 The appearance of the Skewb is one of its most attractive features. This version has fluorescent stickers that have a great touch feeling. The solving experience is perhaps one of the best things Uwe Meffert does to some of its puzzles, which is that 'clicky' mechanism the puzzle has when you rotate it. 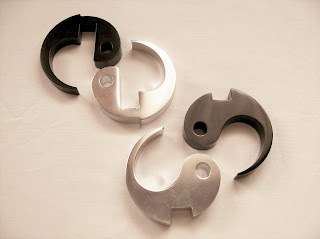 It's a very simple and ingenious design, but ultimately one the most popular Meffert's puzzles and one that everyone starting a collection, should have. 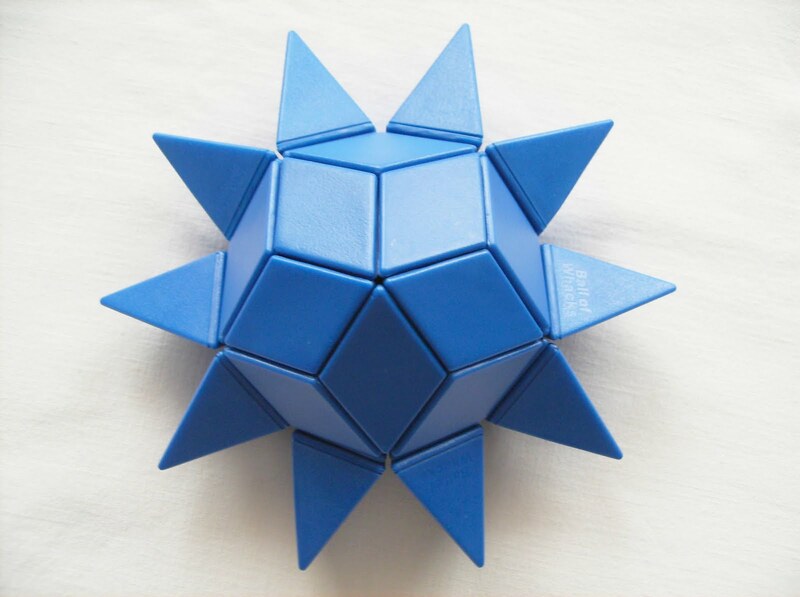 Since its release, there have been a few Skewb versions, like the Katsuhiko Okamoto's Master Skewb, the Drewseph's Elite Skewb or the recently released Tony Fisher's Holey Skewb. 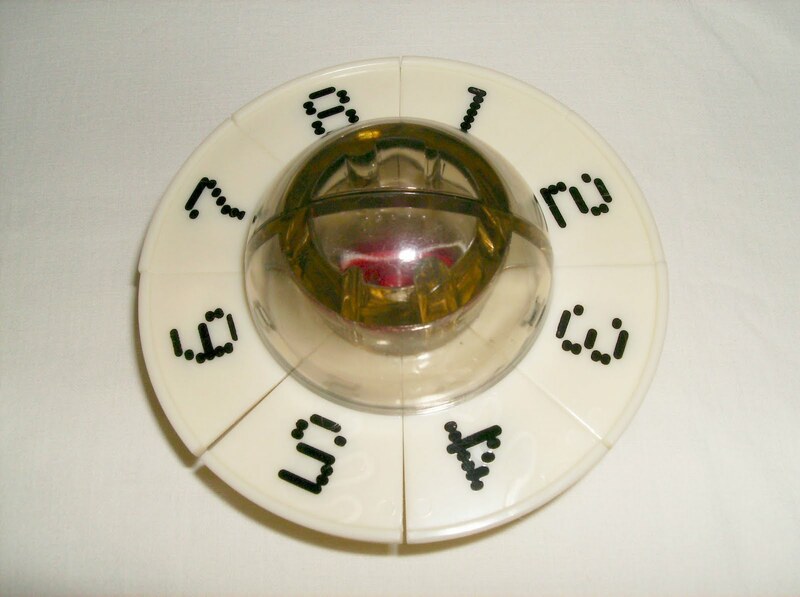 The Skewb mechanism is also used in several other puzzles, like the Golden Egg series or the Creative Puzzleball. 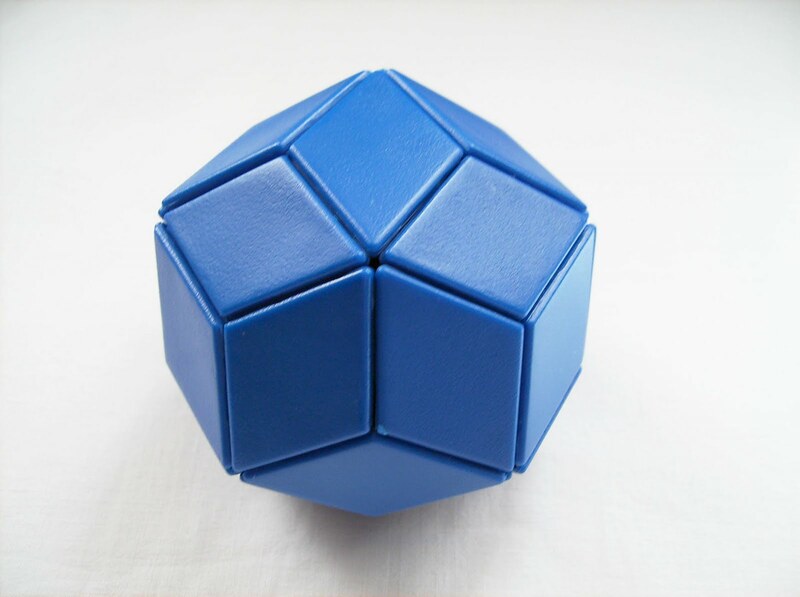 The original Skewb can no longer be purchased at Meffert's website, but you can still purchase one at Puzzle Master. 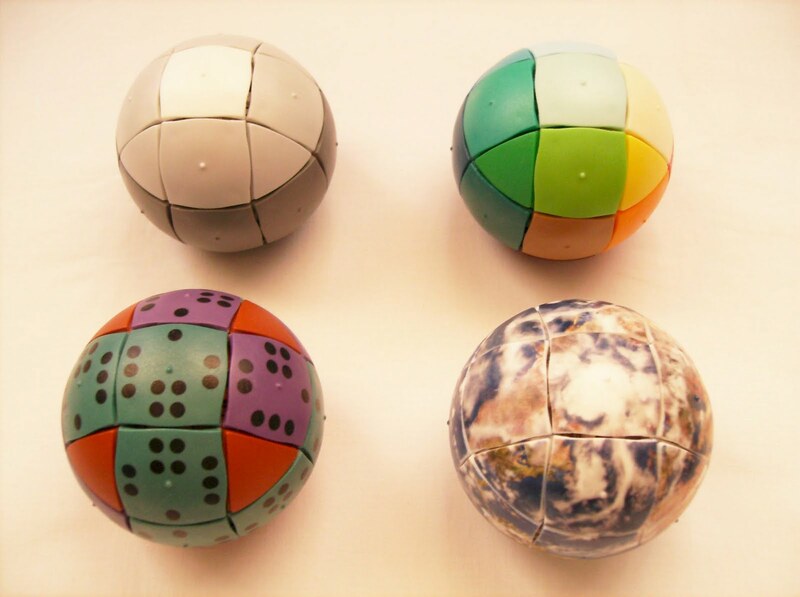 Invented by Roger von Oech, author of "A Whack on the Side of the Head" and two others, the multiple award-winning Ball of Whacks is a combination of 30 magnetic design blocks that can be used to create countless different shapes. 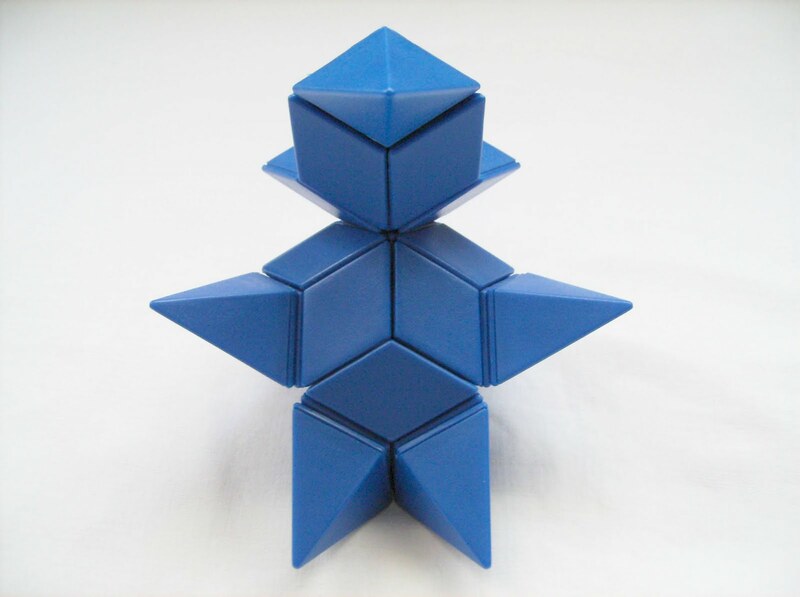 There have been many of these toys over the years, that enable one's creativity to build new patterns or shapes. I personally, have some of these in my puzzle collection, like the Rubik's Snake, the Rekubus cubes or even the classical Tangram. So what does the Ball of Whacks have that makes it so special? ...Well, the 30 pieces that make the Ball of Whacks are built with 180 rare earth magnets, that enables you to combine the pieces, in order to create any kind of shape your imagination can think of. It's a great way to exercise and stimulate your brain. The pieces only connect with the faces that perfectly fit together, otherwise they repel. When you're building the ball shape, you can see that the pieces almost connect to each other by themselves. According to Roger von Oeach, it's a creativity term for "something that stimulates you to think differently". 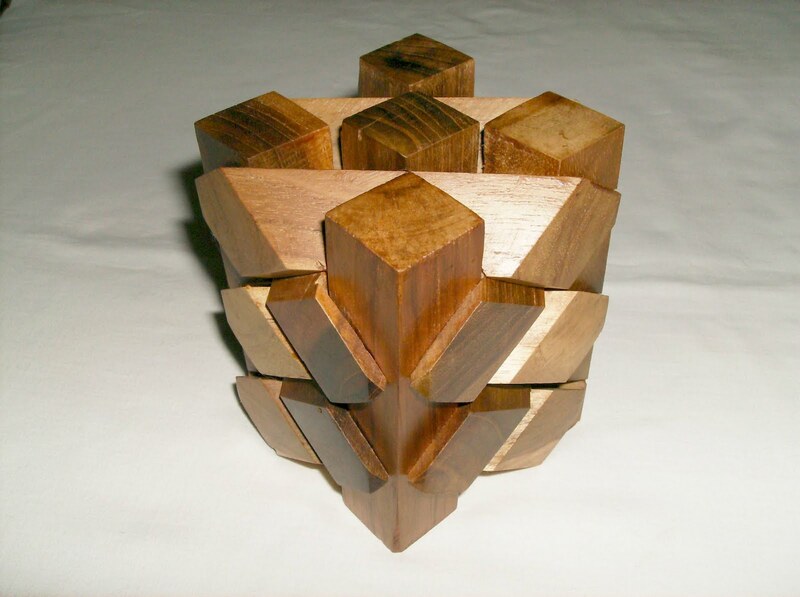 Each Whack piece's base is a golden rhombus, that is, it conforms to the golden ratio which is 1.618. To prove this, you can measure the long and short diagonals of the base and when you compare them, they'll have a ratio of 1.618, represented by the Greek letter ϕ (phi). - Close you eyes and imagine a shape. Now, with your eyes still closed start building the shape you have in your mind. When you're done, open your eyes and see if what you just made, is close to what you were thinking of. 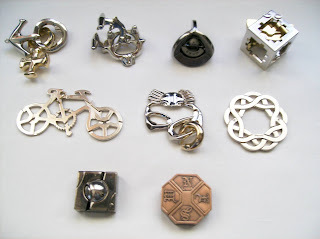 - Another challenge is to get a metallic surface to play with the pieces. Because the pieces have magnets, you can build different patterns on the horizontal plane. There's much more challenges you can make. You'll find them on the 96 page activity book that comes with every Ball of Whacks. Currently, there's four available color versions of the Ball of Whacks: Red, Blue, Black and 6-Color. 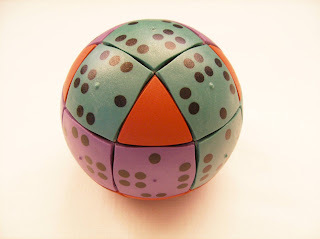 There's a different challenge you can make with the 6-Color BOW, which is to make a ball where no Whack piece touches any other piece of the same color. 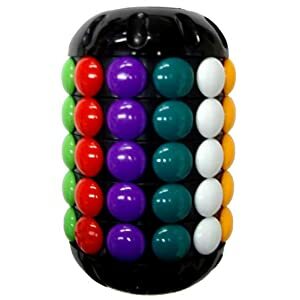 The Creative Whack Company also has available two other magnetic toys, the X-Ball and the Y-Ball, that you can use to make a wide variety of new shapes, and you can combine them with the Whack pieces to form even crazier patterns. In conclusion, the Ball of Whacks exceeded my highest expectations. When I got it, I was very impressed with what you can make with it. It's an ingenious design and extremely addictive. It's a very enjoyable toy that anyone at any age can pick up. Even my mother got fascinated by it, and she's not into puzzles that much. 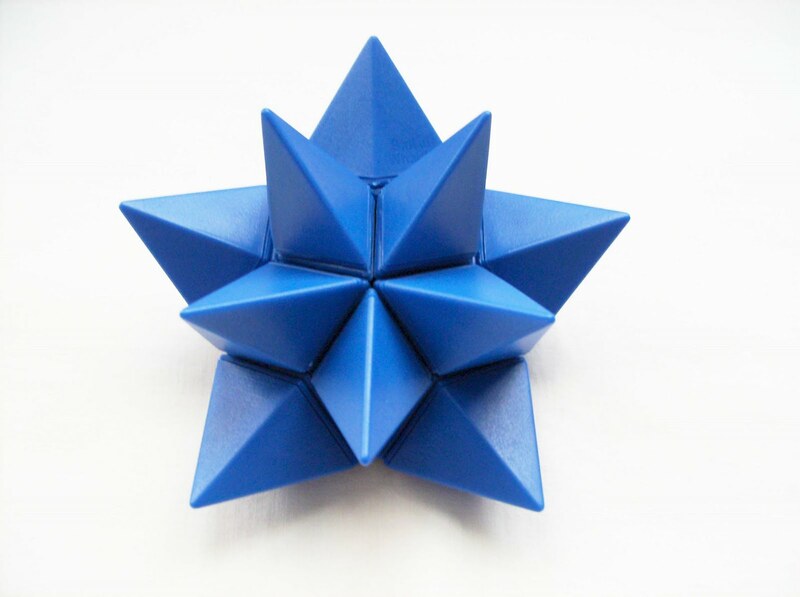 For being a toy that only is limited by your imaginative thinking, it's recommended to anyone that likes to create shapes and patterns with any kind of material and it's very relaxing to just play with it. You can have it anywhere and when you're feeling bored or need to unwind, you can just pick it up and start creating. You'll see that it puts you in a good mood in no time. Video - Since there's virtually no video for a Blue BOW on Youtube, I made a small video for this one. This is the 10th Random Pick from my Collection. 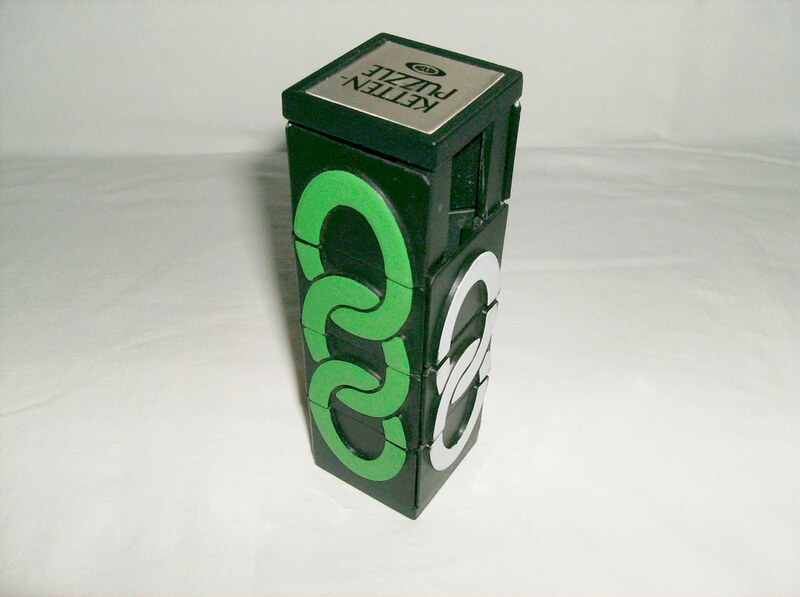 The Missing Link, invented by Steven P. Hanson and Jeffrey D. Breslow in 1981 and distributed by Ideal, has since then inspired new designs like the Whip-it, the Babylon Tower, the Eni Puzzle or the Capuzle. Comprised by four columns and fifteen tiles, with a gap on the white column, you solve it by rotating the top and bottom layers and sliding the tiles up or down. The middle layers don't rotate, which will going to difficult your strategy to connect the right links again. The one I have doesn't turn very smoothly, but I reckon it's because is a bit old and could use a bit of lubricant. Nevertheless, it's a wonderful brainteaser and one of the most recognizable puzzles from the 80's. The difficulty is a little more challenging than the Whip-It, for the reason mentioned above and for having four layers of tiles instead of just three. The Babylon Tower is more closely related to it in terms of difficulty. It has six columns with six rows each, but you can rotate every layer, so it balances out. There's a few different versions of the Missing Link with various sizes, like the Pocket Edition with three layers, the Masters Edition with five layers, the Key Chain and the custom made Super Missing Link with six layers. It's hard to find the Missing Link in stores nowadays, but you can see them often for sale at eBay. The Cast Series are metal disentanglement puzzles made by Japanese company Hanayama. 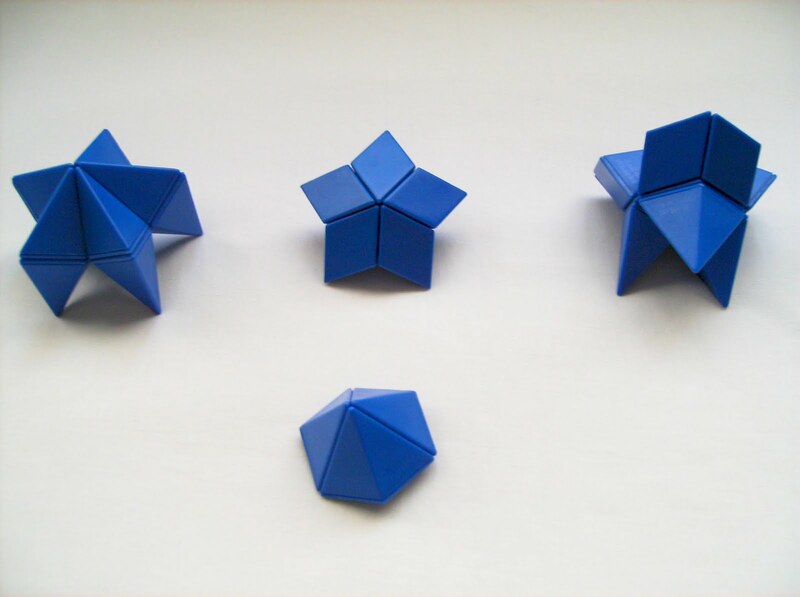 The first puzzles were released in 1983 and since then, more than fifty different designs have been made. Some of them are remakes of old classics that were popular in the late 19th and early 20th centuries. 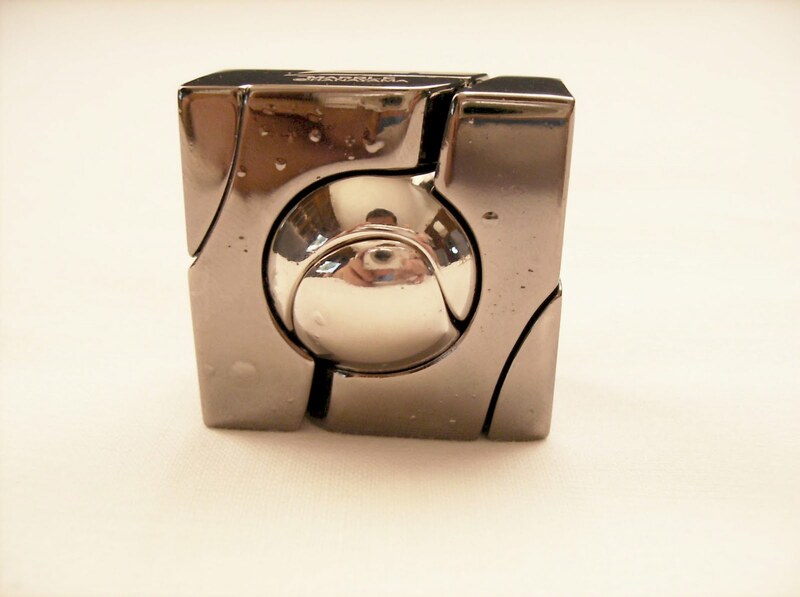 Puzzle designers Oskar van Deventer and Vesa Timonen have contributed with several designs through the years and many more had their designs picked up by Hanayama. 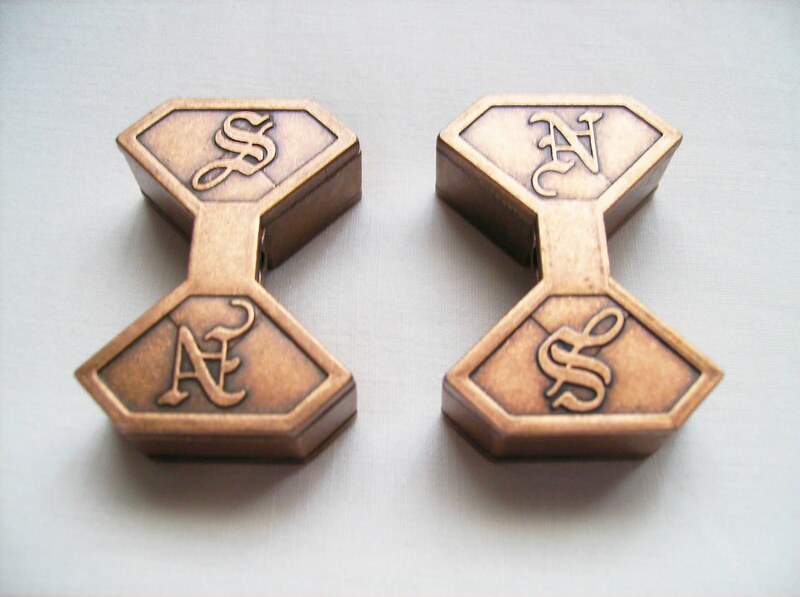 Each puzzle has its own theme, its name and the company's engraved, which makes each and every one of them, very unique. Their packaging presentation is exquisite and it's very nice to see, in the box, the correspondent Japanese character for each one. Also, the build quality is top-notch, with very nice finishing touches. If you're a collector and like to have them displayed on a shelf, their box is a nice way to do this. There's six levels of difficulty, from the easiest (like the Bike) to the extreme (like the Elk). The goal is always the same. Can you take them apart? Some of them are so difficult that sometimes you don't even know where to begin. And, as if it weren't enough, you have to put them back to their original state when you solve them. Don't be fooled, as some might be even harder to assemble back together than to take apart, because when you're trying to separate their pieces, you might not pay attention to the method that you used or you may as well got lucky and you don't know for sure what you did to solve it. Next, I'll present some of these cast puzzles, the ones that I currently own and solved. I managed to solve most of them (six out of nine), but I'm still trying to figure out those three that keep intriguing me. This was the puzzle that got me into the Cast fever. 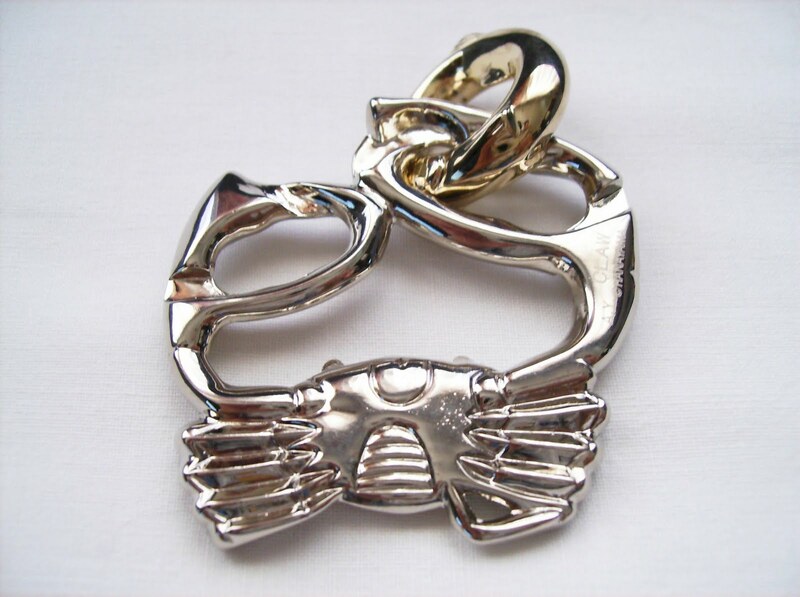 Designed by NOB (Nobuyuki Yoshigahara) and released in May 2003, the design is one of the most beautiful from Hanayama's series, with the American Text font used for the N.E.W.S letters. This is rated as difficulty 6 (the maximum), although I was able to solve it in a couple of minutes, mainly because I recognized the mechanics involved from a similar puzzle I solved a while back (X Marks the Spot). When I heard the pieces move around inside, I knew what I had to do in order to open it. If you're unfamiliar with this concept, then you'll have a hard time figuring out what's going on inside it. It's still a wonderful puzzle and very fun to watch your friends trying to take it apart. Solution: Click here to download the solution. The Cast Bike was released in 1994 and it's a remake of an old classic from the end of the 19th century and I must say, perfectly made, as it turned out to be a very elegant and neat design. This one is actually very easy to solve. Rated as difficulty 1, it uses the same principle as the ABC Puzzle, which is to follow the maze on the bike with the ring, through the entire length of the puzzle and free it from the frame. It's a little harder than the ABC, but not that much, because you'll eventually solve it by trial and error. It's a nice puzzle to get started in the Hanayama series and one that everyone can pick up and solve it without any frustration whatsoever. Video: Click here to see a video solution of the Cast Bike. Created by Bram Cohen and Oskar van Deventer, the Cast Marble was released in April 2009. It's one of the most beautiful in the series and for someone that may see it for the first time, might not even take it as a puzzle. 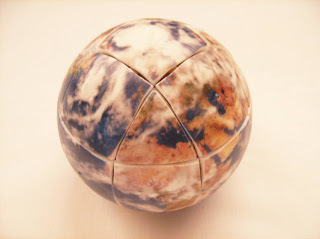 The Marble was the only Cast puzzle so far that I've seen with a little imperfection. It has some air bubbles around it that were perhaps caused by the coating finish not to dry properly. It doesn't hinder you from enjoying the puzzle, but it's unfortunate nonetheless. 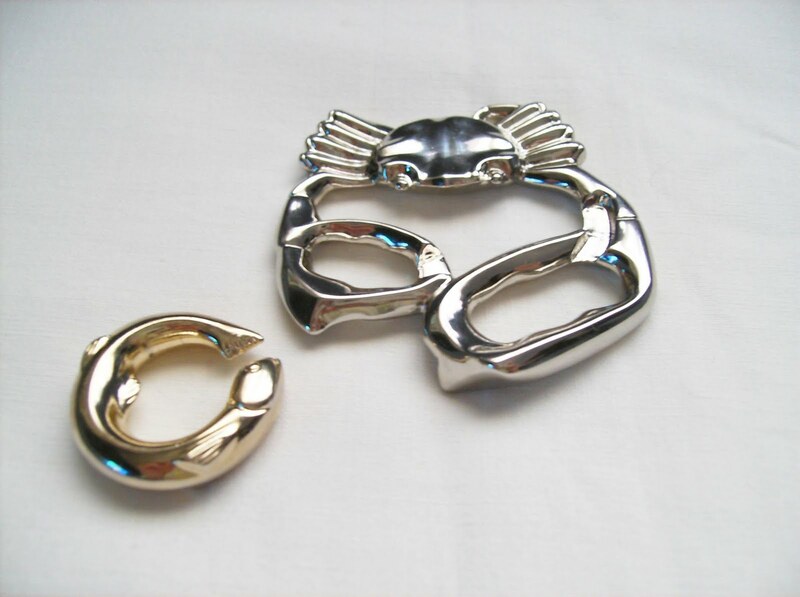 The Cast Claw (or Crab), released in March 1999 is part of the Marine Series by Hanayama and designed by Akio Yamamoto. Currently, there's six different designs and they vary from difficulty 1 to 3. The Starfish is my favorite and most certainly, one of the next purchases in the Cast series. It's only difficulty 2 and the method is similar of the ones used in ABC and Bike, in which you have to follow a path in order to release the other piece. It's harder than those two, because the final step to release it, is not so straightforward as you'd think. 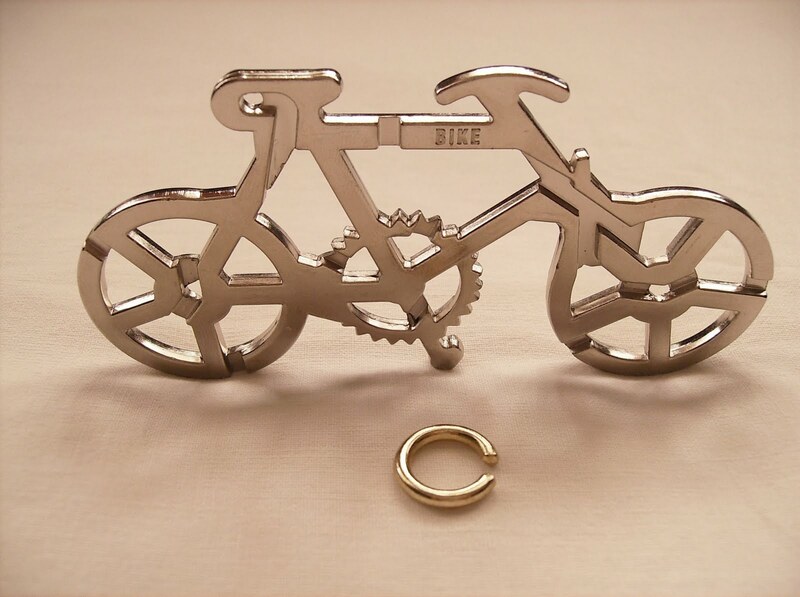 The design is very original, with a small fingerling as the ring. Released in April 2006, the Coaster was designed by Ukranian Serhiy Grabarchuk. Looking at it for the first time, it's one of those puzzles that actually don't look like one. 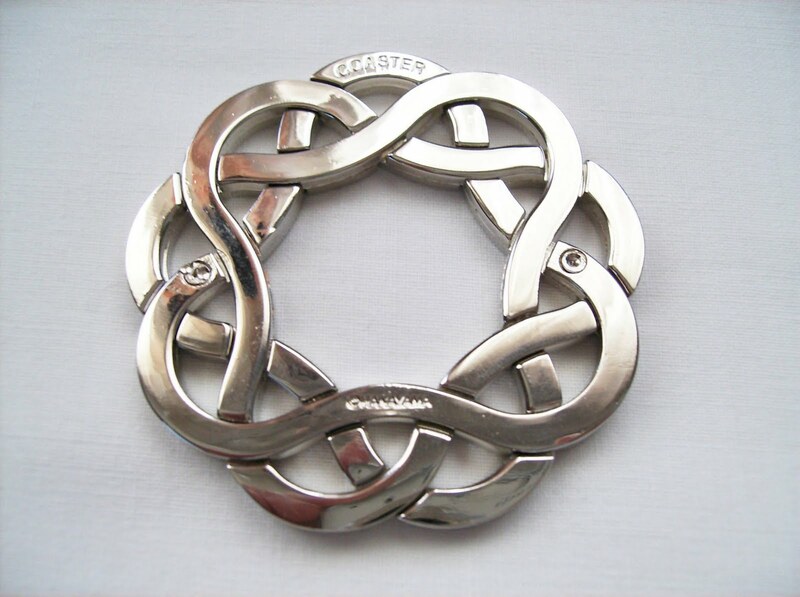 It's made by three interlocking rings that when put together, form a perfect bond that looks like a glass coaster. 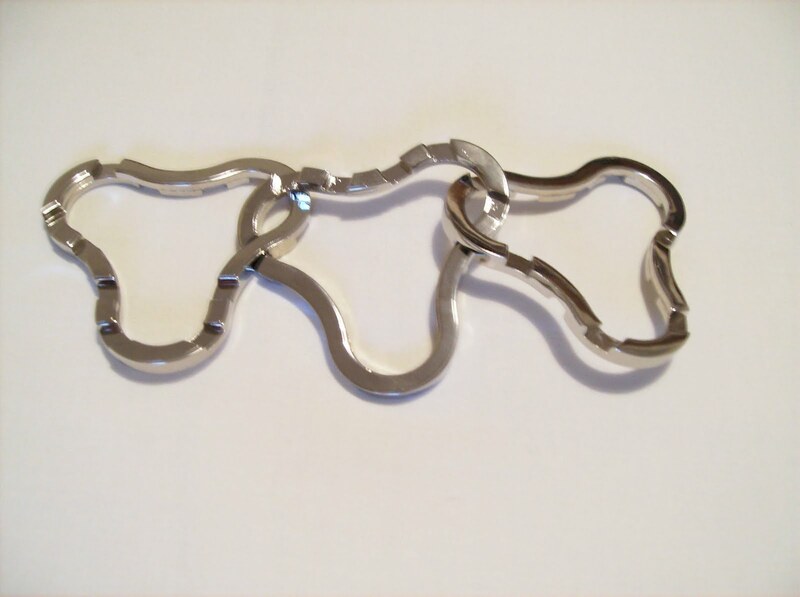 This bond resembles the one used to make the 'Lucky Clover' by Oskar van Deventer, where the four pieces are also intertwined in a way that looks impossible at first sight. Rated as level 4 of 6, this is pretty tricky to separate. 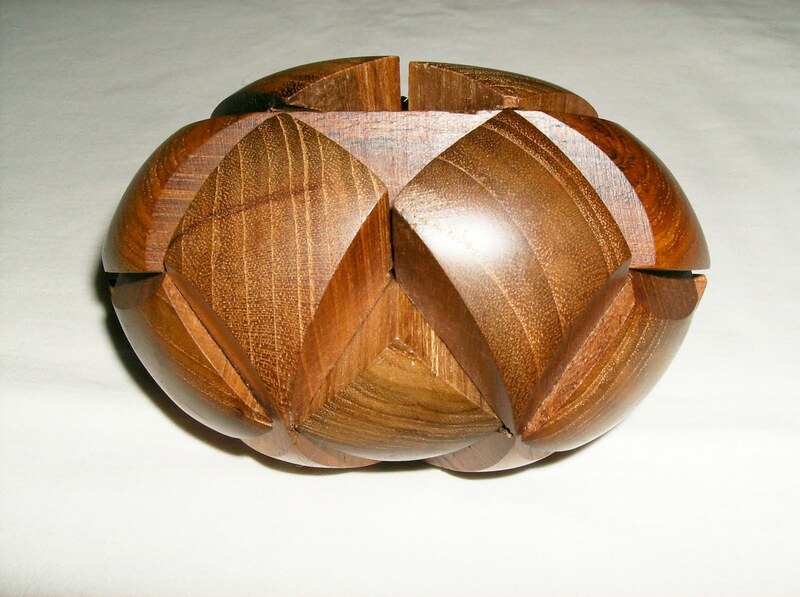 You have to pay close attention to where each of the three pieces are joined together and slowly try to pull them apart. You'll see that the pieces will move more freely, and when you least expect they're separated. Putting the puzzle together is another great challenge. I'm not sure which task was more difficult, because when you try to link them back, they have to fit perfectly into each other's grooves. The key is to always start with the middle ring, as it is easier to see its orientation due to the engravings on it. 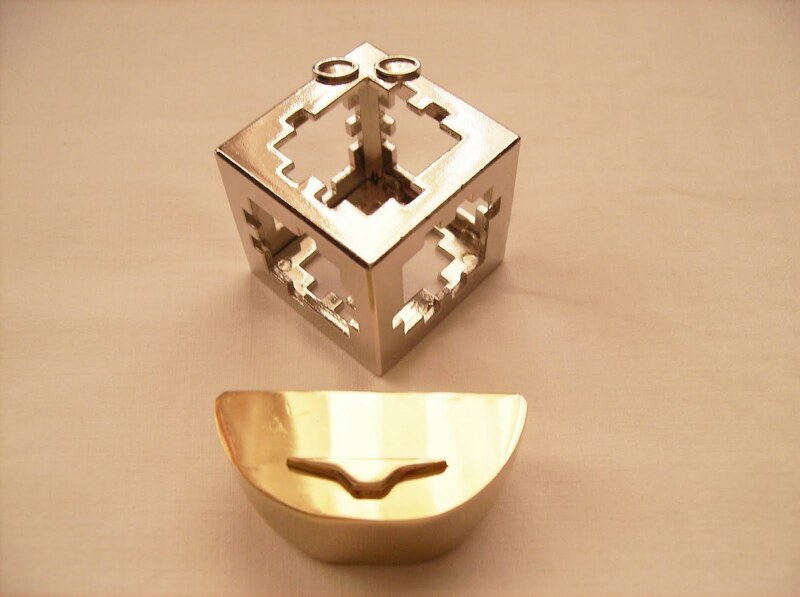 Another clever design by Oskar van Deventer, the Cuby was released by Hanayama in October 2005. Rated as difficulty 3, the puzzle is a cube in which you have to guide the piece trapped inside, through a maze and free it. There's small grooves on every face, but only one of them is large enough to allow the piece to go through. You move around by sliding this piece on the smaller grooves' adjacent faces until you find the way to the larger and last groove. 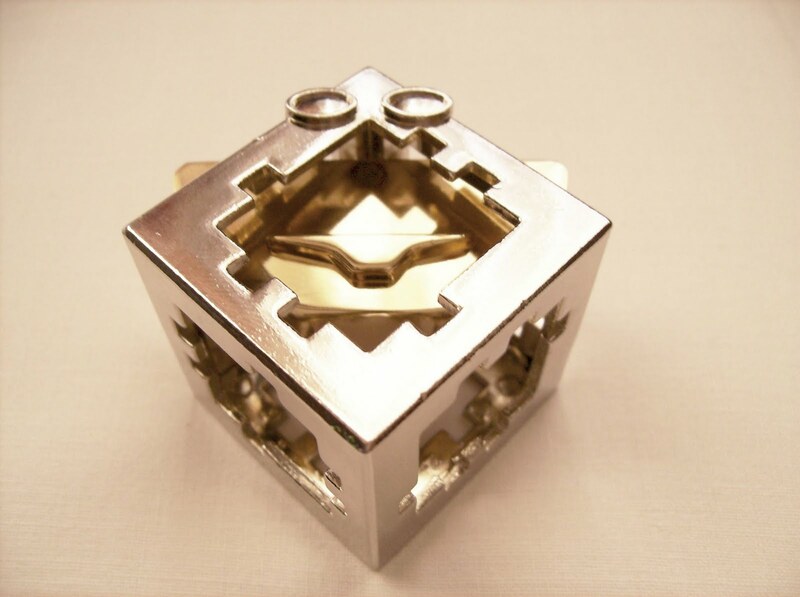 The starting position on the Cuby is a smiley face made by the central piece and the eyes in the frame. When you solve it, you have to return it to this starting point, so if you pay attention to the steps used in freeing the piece, putting it back is just following those steps backwards. Sounds simple, but when you're just concentrated in taking it apart, it's easy to forget how you did it. The Cast Puzzles are definitely a must have in every collection, not only for their beautiful designs, but also because each one provides a different challenge, leaving amazed even the ones that don't like puzzles very much. 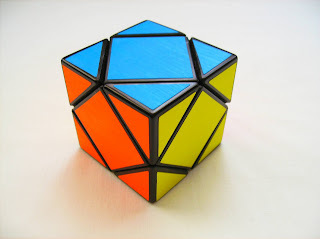 None of them comes with a solution inside, because the company believes that "you have to experience the fun and frustration in solving these puzzles". Doesn't matter how many of them you solved so far and how good you are at solving puzzles, because when you have a new one in your hands, it will make you think, for it will be so different from the others that what you did with them, it won't help you in solving this one. I still have three unsolved, the Dolce, the Equa and the Elk with difficulties of 3, 5 and 6 respectively. With the exception of the Equa, the other two seem so simple that it's hard to think of them in another perspective. Maybe I'm missing something or I need to approach them in a different way. All of the Cast Puzzles being sold right now are available at PuzzleMaster. 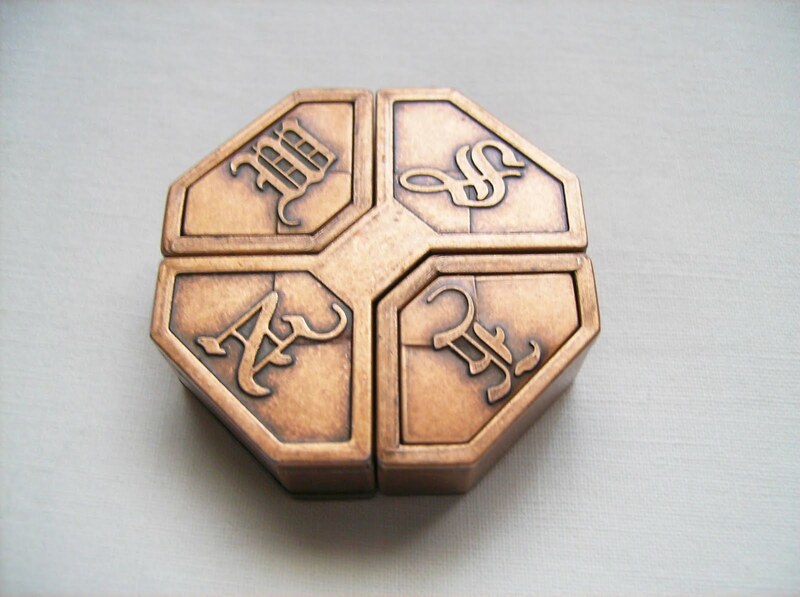 The Secret Treasure belongs to a series of Secret Boxes that are sold in SeriousPuzzles.com. 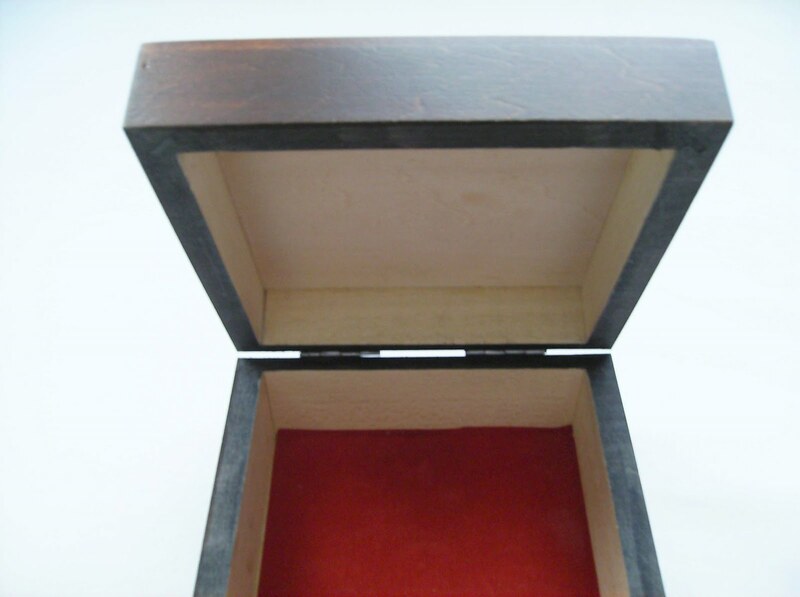 Secret Boxes are somewhat similar to Japanese Puzzle Boxes, although you just need one or two movements to open them, unlike the Japanese ones, where you have to make a sequence of movements to solve them. They are also much cheaper, but their quality is not less impressive. 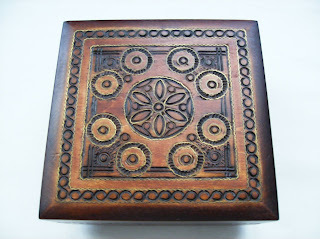 This particular box has an amazing craftsmanship and is visually stunning. 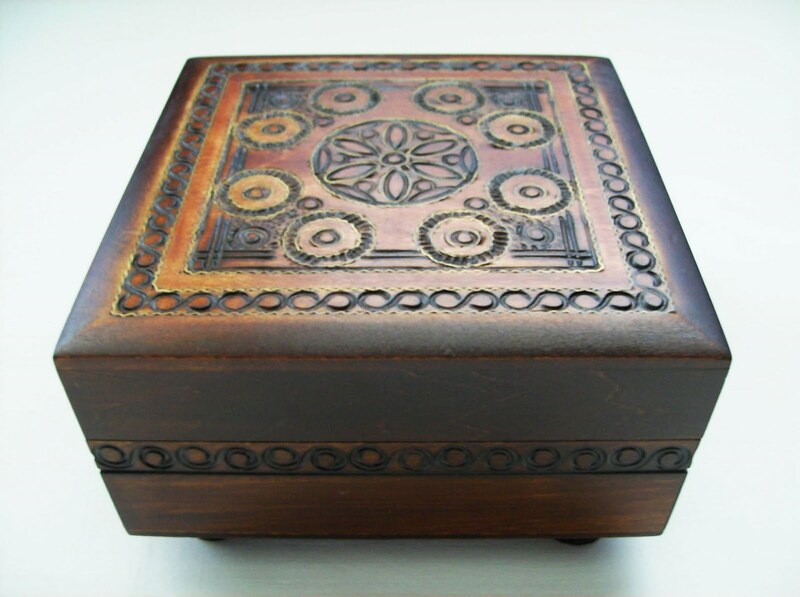 It's made in Poland, from linden wood and hand carved with brass inlay and also has the interior lined with a red velvet-like material. It's not so difficult to open. A close inspection to the box will probably suffice to open it in less than 5 minutes, so not a great challenge there. This is not a bad thing, at all though, because when you buy a box like this, you aren't just buying a puzzle to pass the time, you're purchasing a beautiful piece of art. If you're a puzzle collector like me, then you'll understand why even an easy puzzle like this is worth its place among the other ones. Yin & Yang by Doug Engel is an interlocking puzzle available at SeriousShops.com. 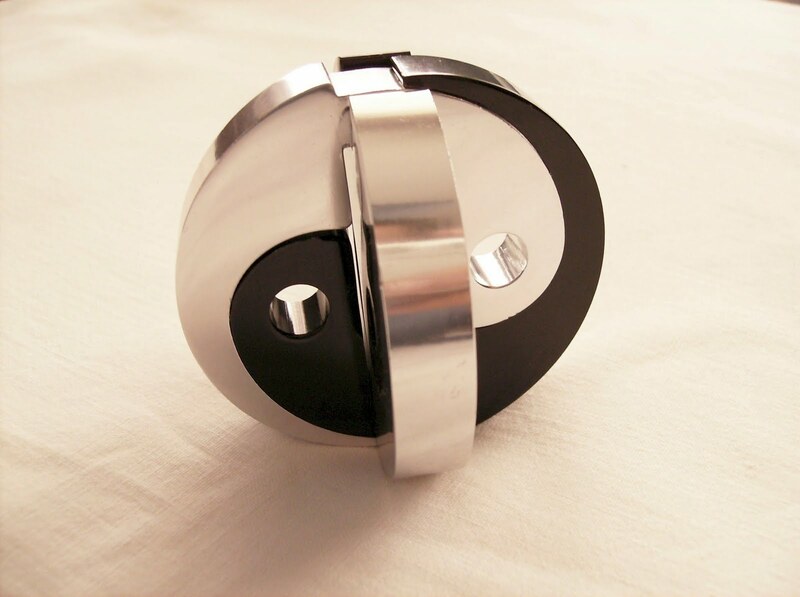 It was entered at the 2004 24th IPP Design Competition, at the time by the name of Double Monad. 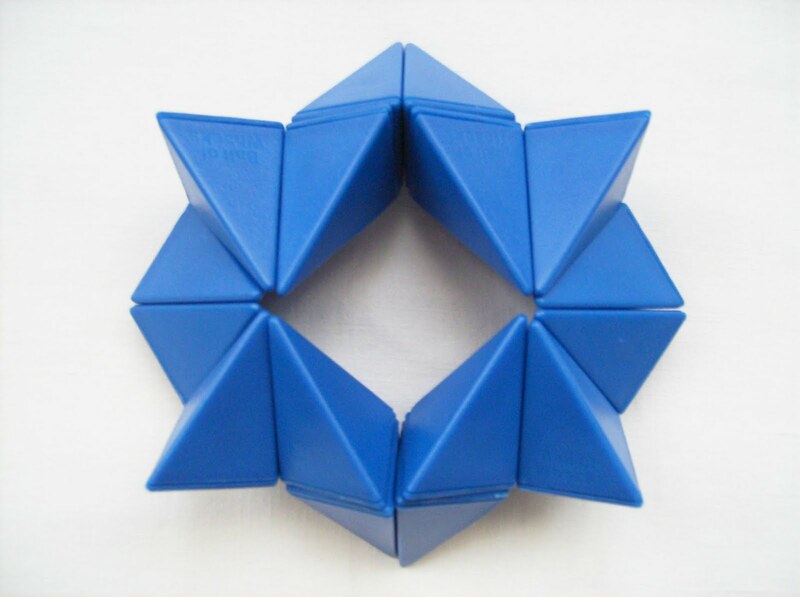 This ancient Chinese symbol, that represents opposite interconnected forces in harmony, is an inspiration even in puzzle building, which at first glance, it doesn't remotely look like a puzzle. Like every other puzzle like this, the goal is to take it apart. 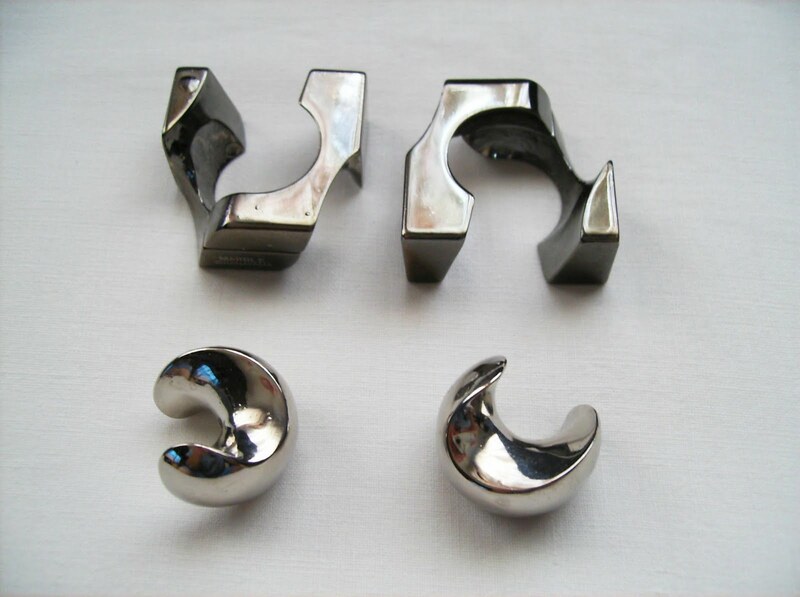 There's four interlocking nickel plated pieces that together make two overlapped Yin & Yang symbols. When you take it apart, your new and probably harder task is to return it to the original form. Since the pieces aren't very tight together, you'll be able to move them easily. It doesn't mean that it's that easy to solve though, because you still have to figure out how the pieces are joined together and which one will be released first. For a first timer, it may take a while to solve it, but if you're used to this type of puzzles it shouldn't take you more than 10 minutes. The Yin & Yang is currently being sold in some European puzzle stores between €25 and €30 (~$32-$39 USD). That's why I was so impressed to see it at $13.95 in SeriousPuzzles.com, so get it while you can. The Bolaris puzzles were invented by Finnish industrial designer Hannu Hjerppe. 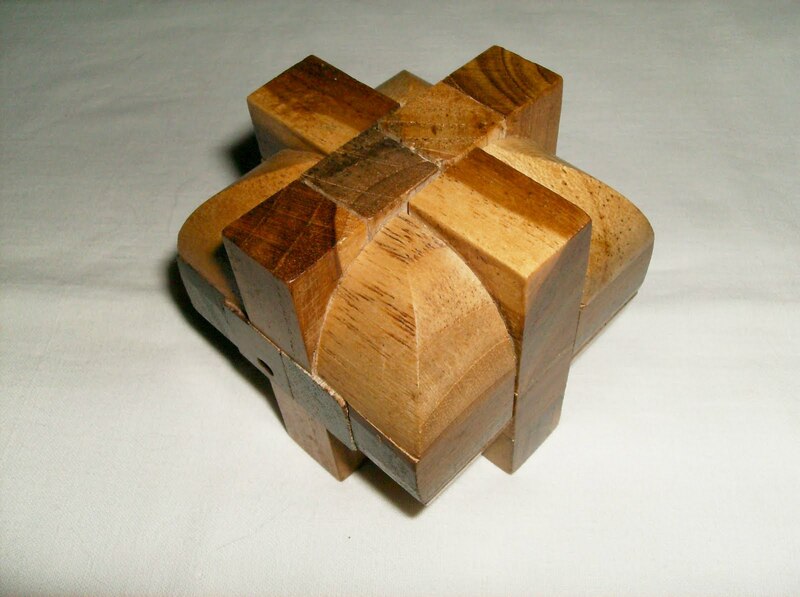 Since late 2007, his company, Diff Design, located in the lovely Fiskars village, produces all the puzzles that are now sold across the World (See end of post for a list of online stores). With the exception of the Bolaris Color, the other three versions were entered at the 2009 29th IPP Design Competition. 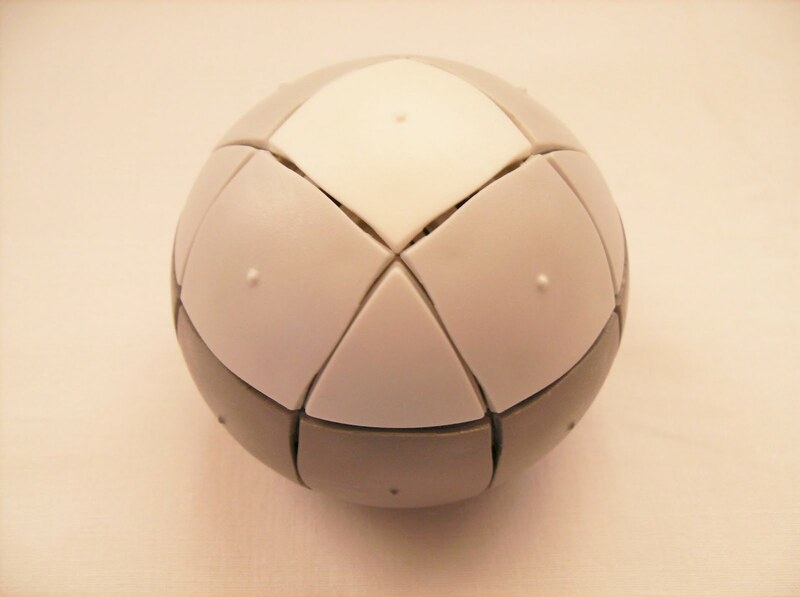 The puzzle is essentially a 2D sliding puzzle, except it uses a ball for a frame. Only the rectangular tiles slide, as the triangular ones are static, so a little more difficult than you'd expect. This particular triangle feature will prove to be very useful, to correctly orientate the rectangles in two of the puzzle's versions, as you'll see below in the individual descriptions. There's an empty slot, just like any other 2D slide puzzle, that enables you to move around and it will always be at the bottom, in the solved state. The Bolaris uses a clever locking mechanism that prevents any unwanted movement, so you will only move one tile at a time. The rectangles aren't cut in a straight line, instead they have a curvy boarder that avoids locking with other tiles (another nice touch to the already great design) and you can slide them with ease through the rails of the frame. This is the easiest of the four Bolaris and the one that you should start, in order to familiarize yourself with the solving process. After you have scrambled it, the main goal is to have a grey scale, starting with the "North Pole" (white) and make each layer having a darker shade of grey. You can also try a second challenge, and a bit more difficult, which is to have a checkerboard pattern with the darker tone at the top. 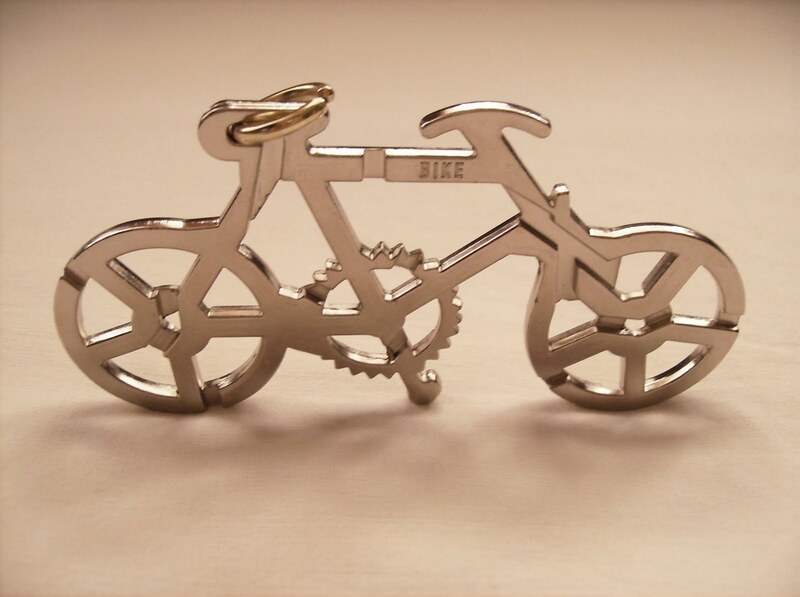 The company is now producing this version for customized promotional gifts. 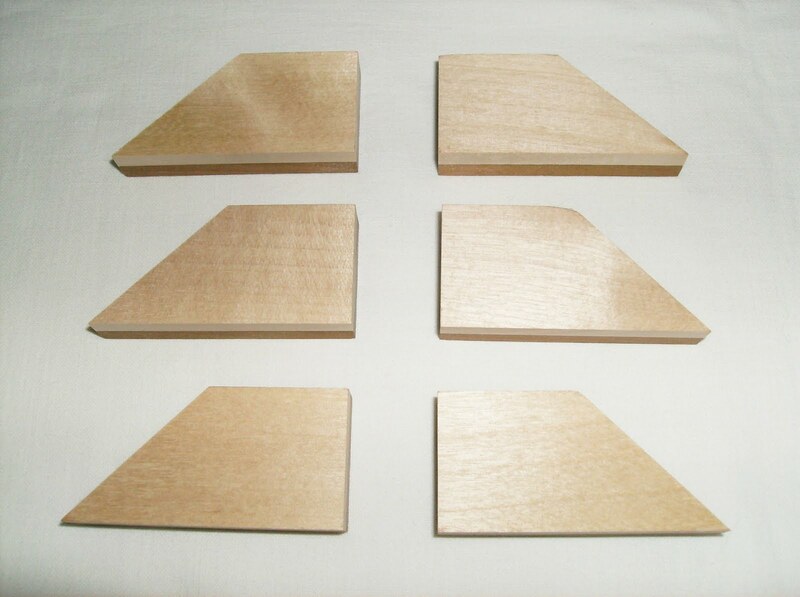 Your logo will be printed on the white tile, making it an elegant and neutral puzzle. With the added part of not being so difficult to solve, it's the perfect gift for any puzzle enthusiast. The Bolaris Color, perhaps the most popular of the four designs, for its colorful appearance, is the next in difficulty. Described by the inventor as a color wheel in 3D, you solve it by following a harmonious tone shift between tiles, where one color will be followed by a slightly lighter or darker rectangle. While you aren't going to have any problems, regarding how to orientate a tile, this will be more challenging than the Grey one, because you have to know where each tile goes and where's its correct position in the frame. Here, you'll have the white and black triangular corners to help you. Around the white corner, there'll be all the light tones, whereas the dark tones will be around the black one and the complementary colors will be on opposite sides of the ball. 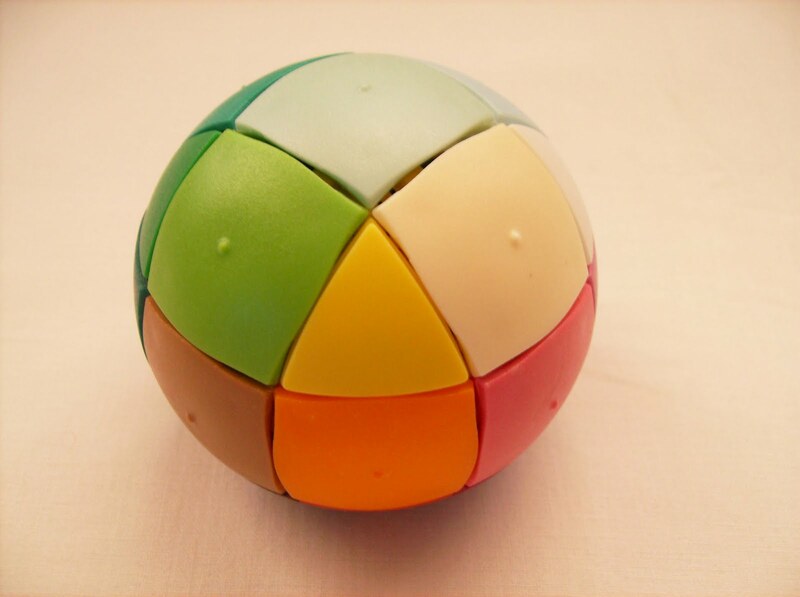 You can use the back side of the puzzle's box to guide you as a last resort, as there's a diagram of the four sides of the ball with the correct color positions. The Domino is where the more difficult solving process begins. With this one, you'll have to worry about the orientation of the tiles. To solve it, every tile has to match the point value of the adjacent tiles around itself, so you'll need to have a continuous matching chain of dominoes over and around the ball, from the equator up. I don't know if every Bolaris Domino comes unsolved, right out of the box, but this one did. This made things much easier, because I didn't have to scramble it or worry about the fact of having to return it to the solved state. As it was already messed up, I could play around with it and explore how it would work. After having finally solved it, I can tell you that it's a very rewarding feeling, being able to return it to the original state. After you study where every tile should be, you can start by one face at a time (by one face, I mean a side of the ball where four corners are facing you). You can also use the back side diagram on the box to help you here. When you need to orientate a tile, you'll have to use the corners. Notice that, when you rotate a specific rectangle around a corner and every time that it returns to the same exact position, it will have a different point orientation, as it will be 90º sideways depending on the direction that you made the rotation. When you're left with just one tile to orientate and it's already where it's supposed to be, you can use three of the blank tiles to help you rotate it to its correct position, thus not messing up the other rectangles. You can do this by using one of the corners and make that continuous sliding movement around it until the tile is in the desired orientation. Now you just need to return those blank tiles to the bottom of the frame and your Bolaris Domino is solved. There's two color tones on the domino (not counting the blank ones), and each one will have the same point sequence for every tile of the same color (1-3-2-4 for the purple ones and 1-2-4-3 for the green ones, with a clockwise rotation). This is the most fun version to solve, as it's challenging enough to keep you guessing where each tile needs to be, but not so frustratingly difficult that could make you put it aside after many unsuccessful attempts. The harder of the four versions, but also the most beautiful and spectacular one, the Bolaris Globe is for those enthusiasts that like a really good challenge. 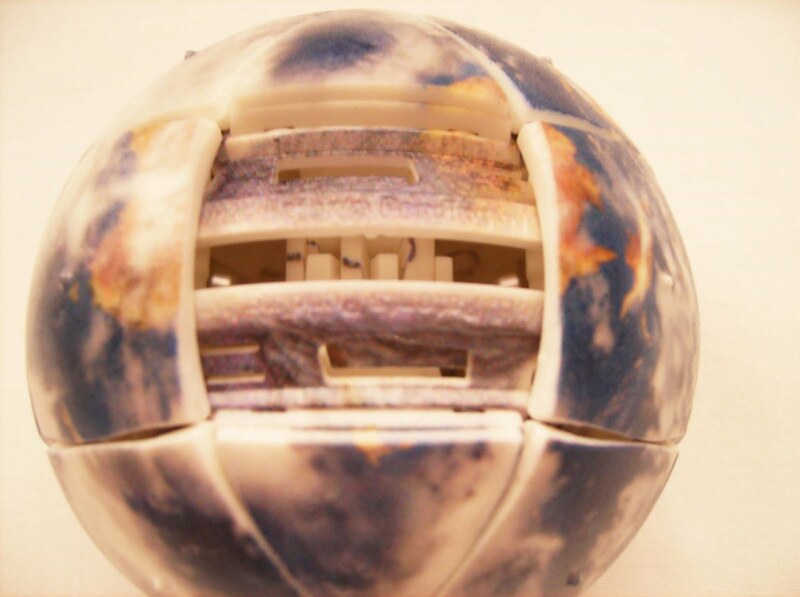 The picture used in the puzzle is the world as seen from space, covered with clouds. Your guidelines here will be the continents, coastlines and the cloud patterns all over the globe. 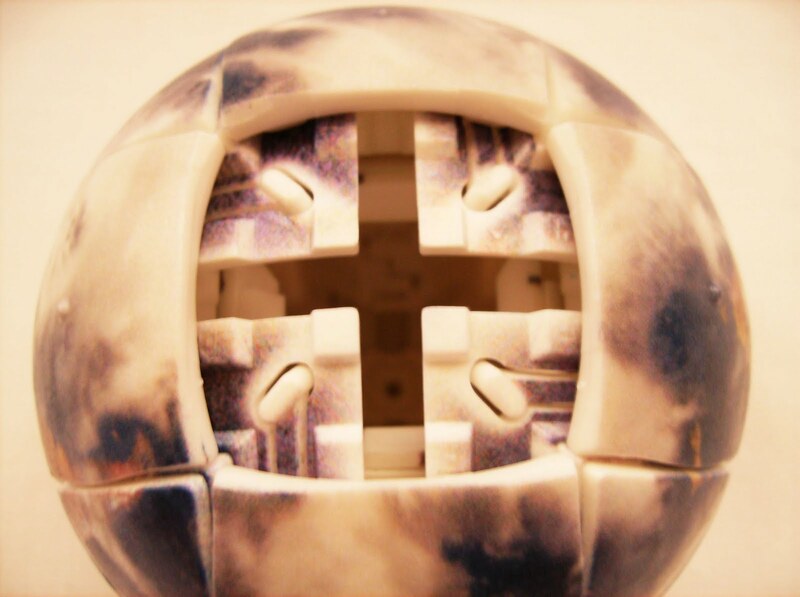 Described in the package as difficulty 3 out of 4, might as well be difficulty 4, because it sure is more challenging than the domino, as the picture pattern around the ball can be a bit difficult to discern, once the puzzle is scrambled. You will have the same tile orientation problem explained above, because each rectangle needs to be in a specific position. As a nice feature, you'll notice that when you slide any tile to another position, it will be visible on the frame, underwater and sub-continental landscapes. A wonderful puzzle, indeed. This is also the most expensive of the four models, although you have to take into account that, each puzzle uses a special UV-inkjet printer to make that image on the puzzle and requires manual work to lay out all the parts into place. I was very impressed with the overall quality of these puzzles. 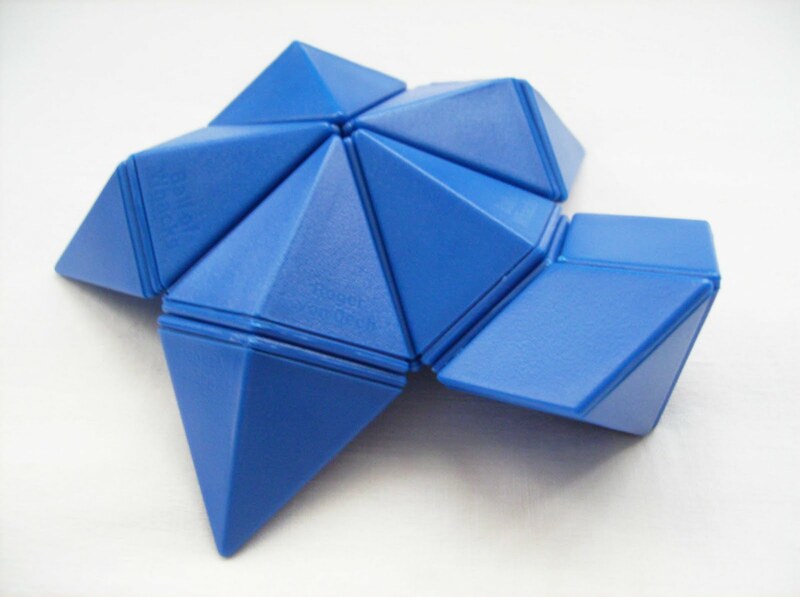 From the presentation of the box, with one of its corners cut, to actually see what's inside, to the clever mechanism used to slide the tiles, you can see that every aspect of these puzzles was well studied and well executed, before its release to the market. 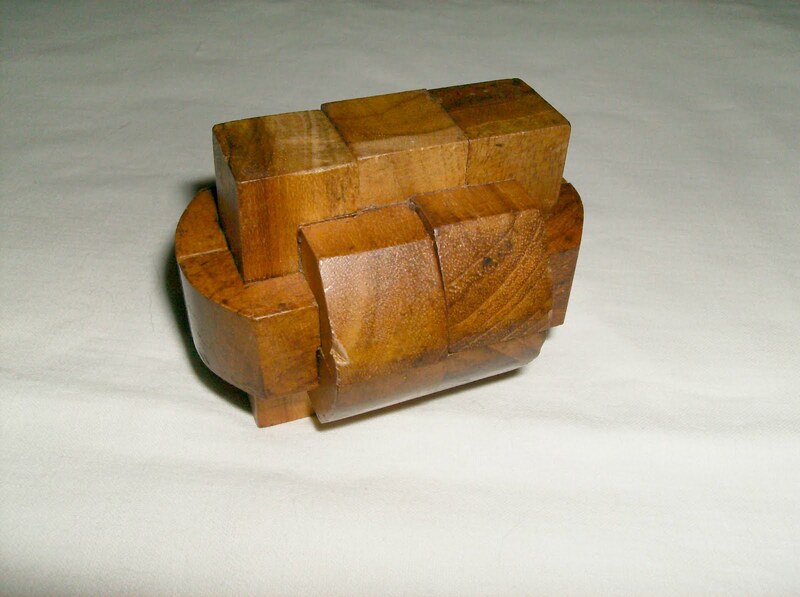 It's a must have in every puzzle collection and a great gift for the occasional enthusiast. I could recommend you all four versions, because each one has its own different challenges and with four degrees of difficulty, there'll be one that suits your needs for a nice and pleasant challenge. If you can purchase all of them, go ahead. I can assure you that you won’t regret it. For wholesale orders or more information, contact Mr. Hannu Hjerppe at info(@)diffdesign.fi or hannu.hjerppe(@)diffdesign.fi (remove parentheses from the e-mail addresses to work). The Saturn puzzle is made and distributed by the Mag-Nif company. They sell other puzzles as well. 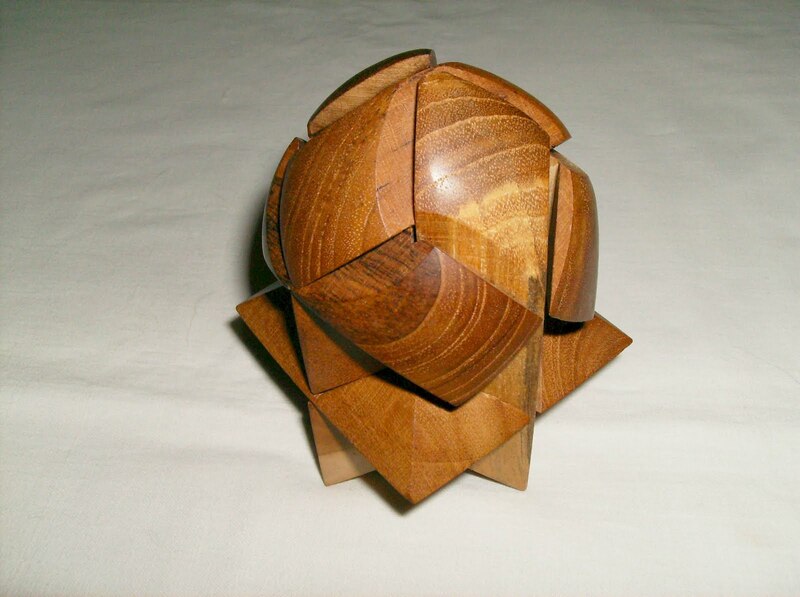 The puzzle itself has eight segments around the middle of a sphere mechanism. They are numbered from 1 to 8 on both sides, so when you rotate them (only four at a time with 180º around the center), they get scrambled with the opposite four numbers of the other side. The disc can also be easily rotated around the center. I have to say, the puzzle turns very well, not only the disc, but also the half turns, which rotates like a breeze. 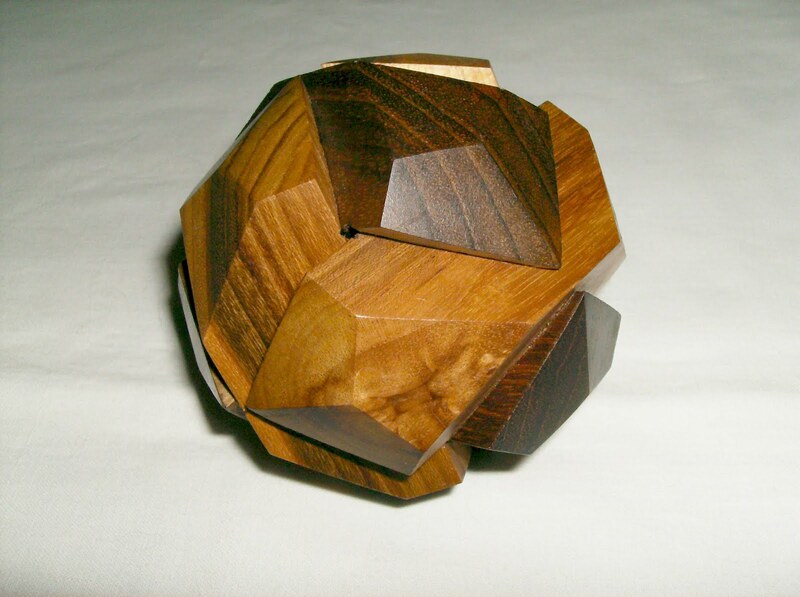 It has close similarities with the Brainball, which has two rotating slices instead of just one, thus a bit more difficult. As Jaap says in the puzzle description, solving wise, is similar to the Topspin and Masterball, so if you're familiar with these, you're not going to have trouble mastering the Saturn. Regarding the looks of the puzzle, and contrary to some people, I love it. It actually resembles the planet Saturn. 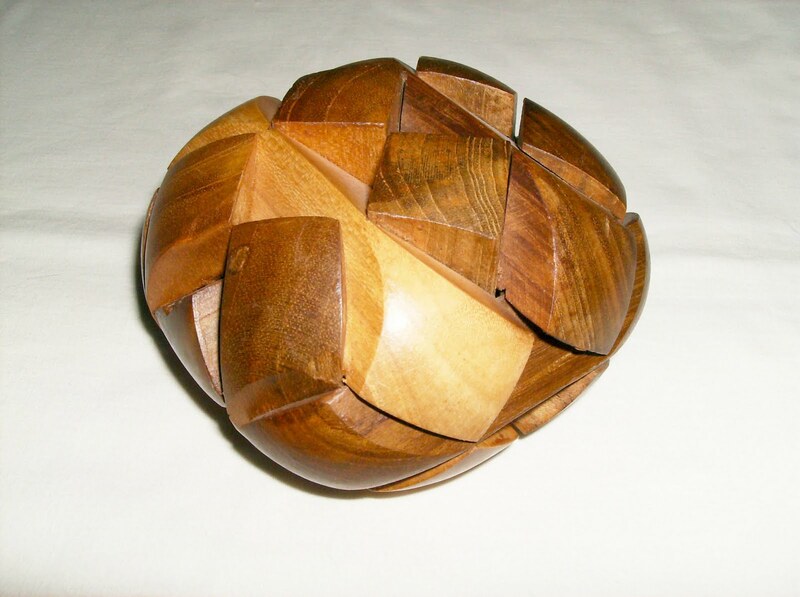 In fact, when I purchased it from a TwistyPuzzles.com member, I had the opportunity to buy the Brainball instead, but I chose this one, as it looked much nicer. This doesn't change the fact that I still want to get a Brainball in the near future, though, because it's a bit more challenging than the Saturn and it's a different puzzle after all, for collecting purposes. The Saturn can be purchased directly at Mag-Nif's website for only $10. Random Pick #9 from My Collection. This week I picked the Crafty Puzzles from my collection. 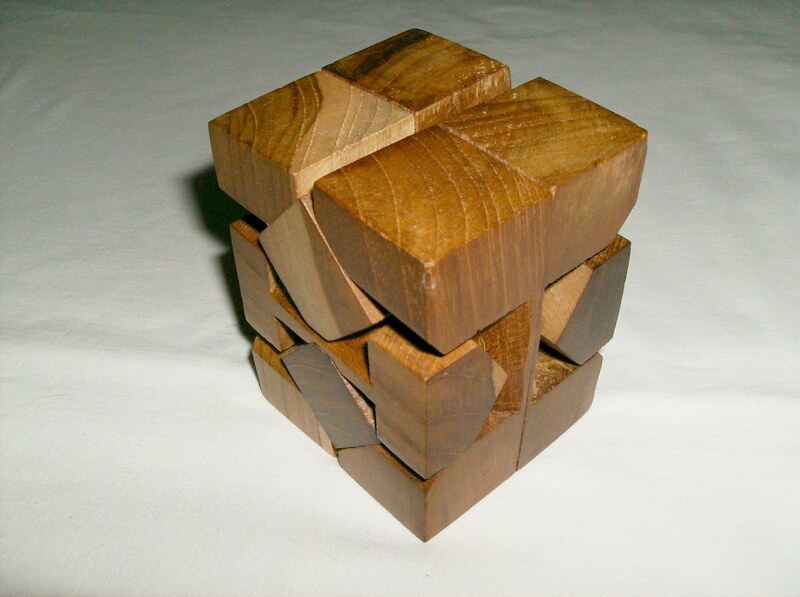 These puzzles are all manufactured by the craftypuzzles.com company themselves, so they're quite unique. 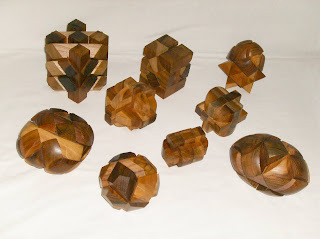 Each puzzle is built from Teak wood and gets an application of Bees wax. You can prove it when you take a puzzle apart and notice that its pieces are a bit greasy in the interior due to this very wax. They can release a pleasant smell from it, though. One thing you should know is that these puzzles shouldn't be close to a heat source, i.e. expose them at direct sunlight, as this will cause the pieces to shrink and it would be a lot easier to spot the 'key' piece on the puzzle then (the one that allows the rest of the puzzle to be taken apart). The quality of the puzzles is excellent. They're very well crafted and many of them are original designs, only produced by the company. They can and should be displayed as ornaments on a desk or on a shelf. As with many interlocking puzzles, these have a variety of difficulties. One of the easiest is, for example, the Crystal Ball and the hardest is probably, the Star Urai. For most of the cases, taking them apart is way easier than returning them to the original state. The real challenge is actually putting them back together... And it gets even more difficult if you don't have a picture of the finished puzzle to guide you. Summarizing, these are very high quality puzzles. Not just for a puzzle collector, but also for anyone that likes a good challenge and on top of that, gets a nice decorative item that isn't just a fancy paper-weight. You can find several more like these below, on their website. 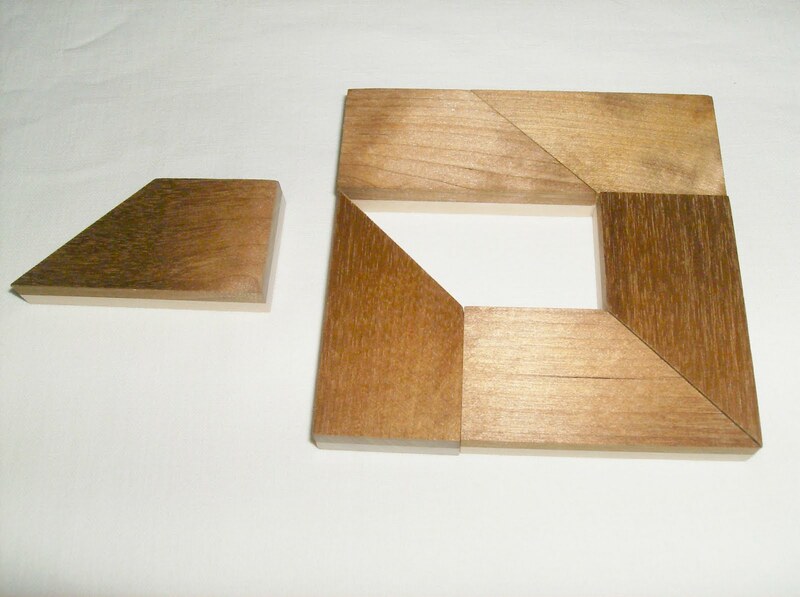 Double Squared is another great invention from the Finnish puzzle designers Tomas Lindén/Vesa Timonen (Sloyd Puzzles) and also entered in this year's 30th IPP Design Competition by the name of Black or White. For more reviews and information, refer to this post. This is one of the most difficult challenges in the Sloyd Puzzle series. Don't be fooled by it's simple presentation and, most importantly, don't underestimate its difficulty. Six pieces, with a light and a dark side, three of each orientation, make this very simple and yet, clever design. The goal is trivial: make a square with either side of pieces, but only one of the two sides must be used to do this. If you use the dark side of a piece, all of the others have to be placed with the dark side as well. This is where it gets complicated, because you can make the square easily, with one of the pieces showing the opposite side of the others in place. But that's not the case, as the designers wanted you to make the square with a specific orientation for the pieces. That's why they made every piece with two colors, forcing you to use just one of its sides, no matter which one, at a time. 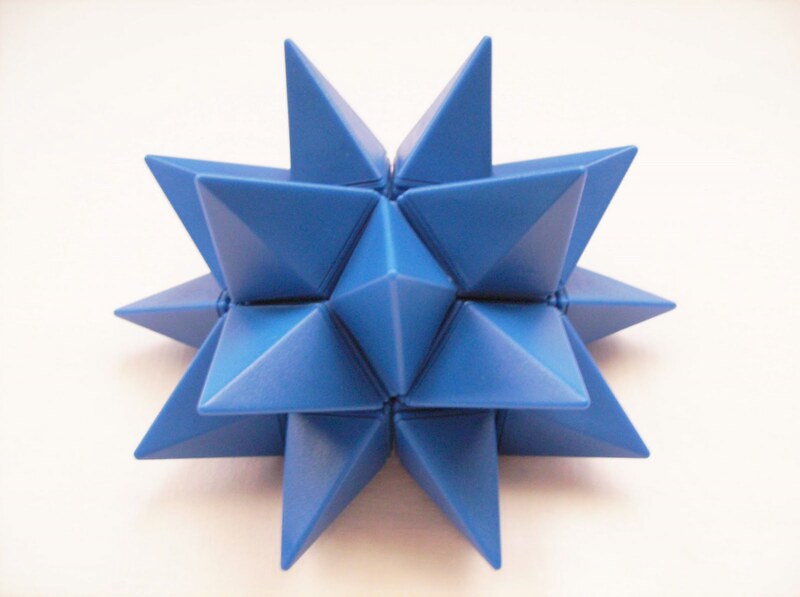 Without the possibility of flipping a piece, in order to change its orientation, it gets extremely difficult to work out a solution within minutes. You will for sure, spend a few hours (or days) studying the puzzle and trying to understand how to make an ordinary square out of those pieces. As with the other Sloyd Puzzles, I will not reveal the solution, as it would spoil all the fun it takes to solve a hard challenge. And I couldn't, even if I wanted, because I'm still trying to solve it (3 days and counting...). I will, almost certainly edit the post once/if I solve it. Not to tell the solution, but with the necessary insight to share a few tips to guide you in the right direction. If you're tired of trying to solve the main challenge without success, there's at least two more challenges that you can make with the puzzles' pieces. 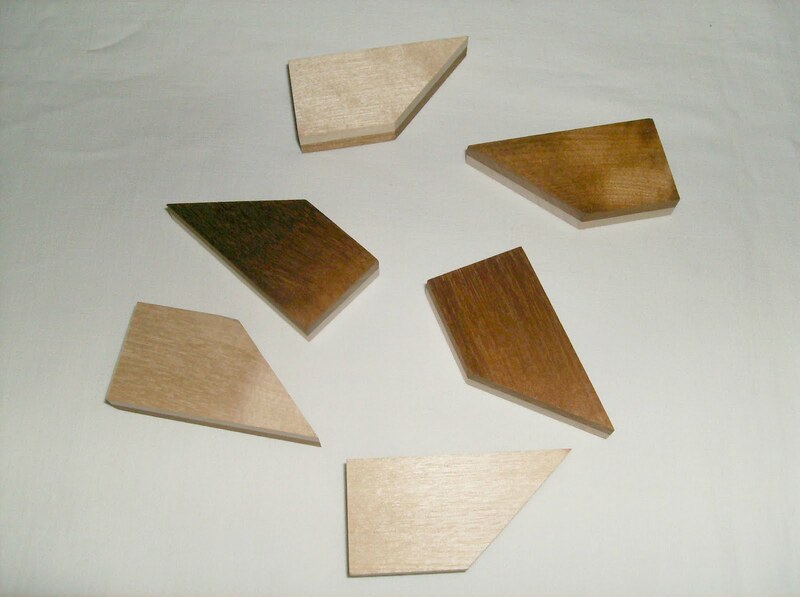 One is to make a light or dark square with a single piece. Easy, right? You can use a pocketbook as a table for this. 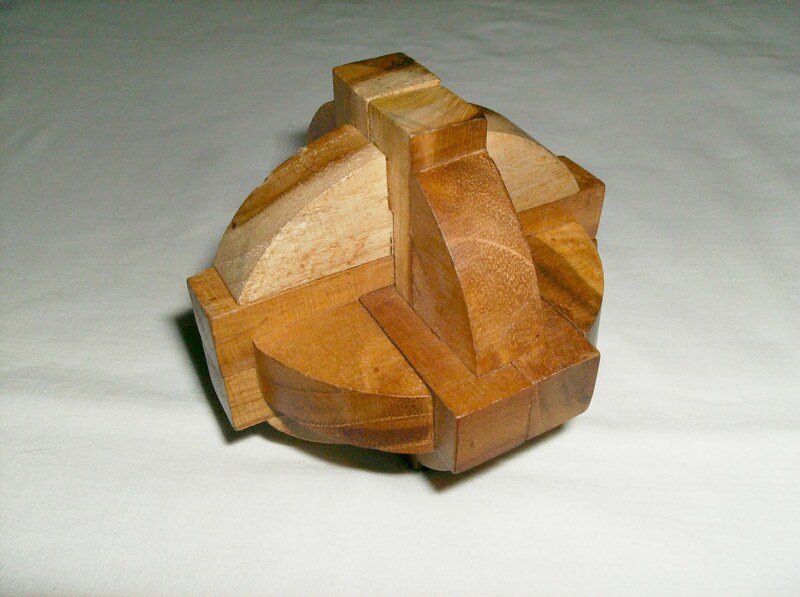 The other one is to make a cube with the six pieces. There's two ways to achieve this, though you have to figure them out for yourself.